If you’ve recently moved to the beautiful suburban town of Hacienda Heights, or if you’re just vacationing here, you know that there is no time for a toothache. With all of the sights of LA that there is to see, going corner to corner in search of a dentist office that will fit your needs should not be part of your agenda. Since there is so much hustle and bustle in this town, you will have plenty of dentist offices to choose from. Emergencydentistsusa.com has made it easy to find the dentist that will be right for you. 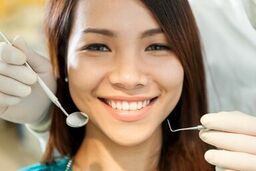 We’ve compiled a list of dentists that are in and around Hacienda Heights. You can view their available hours, the services that they offer, and the type of payments that they accept with just the click of your mouse. If you’re unable to access the info online for any reason, for instance, you’re driving, give our free dentist finder hotline a quick call. A friendly operator will be glad to assist you with your search. They can even book your first appointment and give you directions to the office of your choice. Once your appointment is made, be sure to show up ahead of time and bring a copy of your ID, insurance card, any current prescriptions, and a list of any medications you may be taking. Whether it is a pediatric dentist, an oral surgeon, or anything in between, we’ve got you covered. Hacienda Heights has no shortage of dentists since the city is so large and is continuing to grow. If you experience a dental emergency, it is likely that you’ll be scheduled with a general dentist first. Once you go to that appointment, you’ll be referred to a specialist if it is needed. Description: Hacienda Heights Family Dentistry offers general dentistry for the entire family. For those without insurance, they also offer specials on their website that they can print or claim via email. This makes it easy for everyone to afford a beautiful smile. Description: Tri-City Smiles offers general dentistry as well as orthodontics. They teach people of all ages how to take excellent care of their teeth. With orthodontics, they can make smiles straight and beautiful by using braces, spacers, and retainers. Description: Offering a compassionate doctor that offers general dentistry as well as cosmetic treatments, Maria Balce, DDS will meet all of your needs as a patient. Also offering orthodontic treatments, your smile will look great for a lifetime when choosing this office. They use advanced technology to ensure that you and your family is happy and healthy with their smile. If you are experiencing any kind of tooth pain, don’t allow that pain to continue longer than a couple of hours. If you’ve been in any type of accident or have had trauma to your head, you need to first go to urgent care so they can rule out a concussion. After you do that, it is safe to make a trip to the dentist. If you haven’t had any accidents and there is pain, then there could be an infection. Any infection left untreated will only progress so it’s important to get that taken care of right away. Whenever you’re going to a new dentist, be sure to check their credentials. You can do this easily by checking online or going into the office. Most dentist offices will have their certifications hanging on the wall in the reception area. If you’d like to check before you go, enter your doctor’s name at the Dental Board of California website.